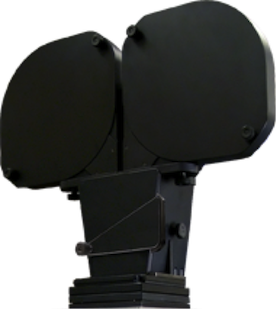 Over the years we have made many variations of cameras and projectors. The list includes dozens of Acme/Oxbery type cameras and projectors (please see our animation stand and optical printer pages). We have also produced many one of a kind transports to fit our customers specific demands. 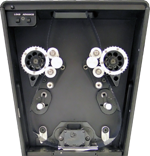 Examples would be sprocket advance transports featuring our proprietary sprockets that provide solid, repeatable registration without pins and wet gates to handle everything for 8mm up to IMAX and removable pin/aperture wet gates to handle shrunken film. The photos on this page show the film recorder camera we built for Lasergraphics (www.lasergraphics.com). It features our standard 35m film transport with interchangeable aperture and pin blocks, adjustable cam for film pressure, and our easy threading 2,000 foot split magazines. Lasergraphics supplied all of their own motors and electronics and their custom software provides unique capabilities such as automatic loop formation.